I watched this video clip and was inspired by the message that Eve received from the woman she was interviewing (once I got past the terrible accent she uses to relay the woman’s story). Eve had asked an African woman what she thinks of her body. The woman was very direct and described incredible things that her body does and how appreciative she was of it. When we choose to compare ourselves to the image of “woman” created by society, it can be easy to forget that our bodies are amazing. Our bodies create and nourish life, and they help us to accomplish our daily tasks no matter how simple or herculean they may be. They deserve to be celebrated, and I needed to be reminded of that. I set out to create my tree after watching that video and reflecting on the life growing inside of me. I thought about all I had overcome and accomplished as a woman – childbirth, breastfeeding difficulties, overcome postpartum and then worked through prenatal depression and maintained a career and a healthy relationship. The only reason I was able to do all of this was because of what my body could do. I am amazing because I am a woman. Being a visual artist, I felt that to do justice to myself and the journey I am on I needed to create my tree. I thought about where I had been, where I am now, and where I wanted to go with the idea of loving myself. I work a lot with symbolism, and I needed to marry the idea of a tree with my body. 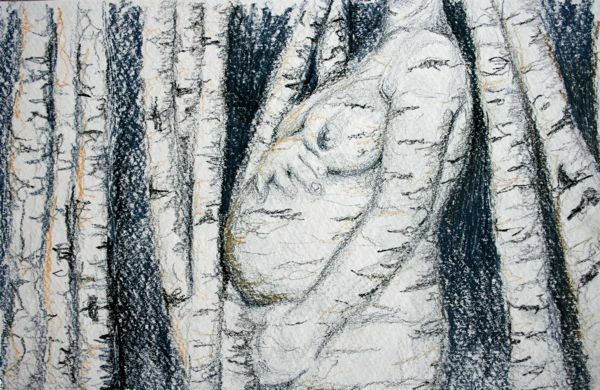 After much reflection I came to the conclusion that I could only do myself, my body, and my journey justice with the paper birch. I grew up watching these trees year after year shedding away the old papery bark and revealing beautiful new bark. Sometimes this rebirth would create scars on the tree reminiscent of the beautiful silvery stretch marks on my own body from my son’s birth and the newer lavender marks from my current pregnancy. This is definitely my tree: it is a celebration of the beauty of the process of stripping away the old negative perceptions of beauty and the uncovering of the beauty that is my motherly body. 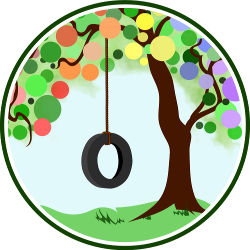 So are you up for the challenge and feeling inspired to “Love Your Tree”? Tell us how you plan to make peace with your body and celebrate the wonder that is woman. Love Your Tree – Amy of Anktangle A beautiful post that discusses the parallels that can be drawn between the stages of a woman life and trees. On Body Image, Pregnancy and BMI – Amy of Anktangle Another beautiful and celebratory post of the amazing accomplishment that is a mother’s body. Beautiful Bodies – Dulce of Dulce de Leche Mindful ways to create positive body images for yourself and your children. Who I’ve Become – Gretchen of That Mama Gretchen Reflective post about how the author’s perception of her body has changed as she’s grown as a woman. The Body Image Carnival – mamapoekie of Authentic Parenting A Western woman’s journey to Africa where she finds the beauty in herself and her physical form. My Daughter Doesn’t Care So Why Should I? – Jennifer of Hybrid Rasta Mama A mother’s reflection on her child’s perception of her and how her perception of herself affects her daughter. I love this. Shannon, your tree is beautiful! This is beautiful, Shannon. I love the symbolism of the paper birch, and the way you describe your reason for choosing it. It’s really hard, but I’m learning to love my tree, too, and I know I have a ways to go. Empowering and beautiful. We need more posts like this! This is incredible, Shannon! Thank you so much for sharing your journey and your art. Thank you all for your positive reviews. I think more women needs to realize the potential beauty that their bodies possess and celebrate that. I love the symbolism and the beauty of your art. Thank you for sharing this empowering message with us! Shannon–thanks for sharing such a thoughtful post. Our world is fascinating and human perception is truly fascinating. The media does an amazing job on selling us on a particular definition of beauty. I wish there was a way we could fight back–propagate and disseminate a healthier way of seeing ourselves and others. Also, while physical bodies are miraculous–what is unseen–the soul–is even more miraculous. While there are certain physical characteristics that I find attractive in a woman–I have always been more attracted to the intangibles: e.g. intelligence, a sense of humor, wit, playfulness, a sense of adventure etc. We need to develop better eyes so that we can appreciate all the trees in the forest. We also need to develop better souls so that they can appreciate their counterparts. now off to work on my own tree. great post, shannon!